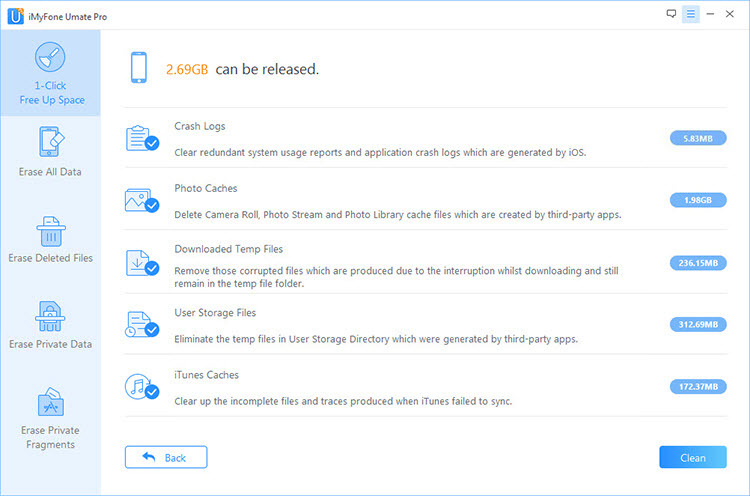 What Do iPhone Maintain in Your Private Files Cache, Anyway? There are indeed a number of applications that can be used to delete iPhone files and data. Files may include messages, photos, junk files, temporary files, app caches and even browser history. All of this takes a lot of space and can result in the iPhone poorer performance. Part 1: Delete iPhone Hidden Junk Files: App Caches, Cookies, Crash Logs etc. 1 Delete iPhone Hidden Junk Files: App Caches, Cookies, Crash Logs etc. It is obvious then that one should always have the most up-to-date and robust cleaning tool that can allow you to easily delete the hidden junk files and hence optimize storage. iMyFone Umate Pro or iMyFone Umate Pro for Mac is a novel and a very reliable iOS data erasing tool which provides the function of deleting junk files from iPhone. And it is totally FREE for doing this with Umate Pro. Go through the following steps to delete iPhone junks easily. Step 1: Launch iMyFone Umate Pro and connect your iPhone to the computer. Step 2: Click the “1-Click Free up Space” option and then click Quick Scan. The software will scan your device for all the hidden unnecessary files. Step 3: All the file categories will be displayed with a “Clean” button toward the side. Click the button of "Junk Files" for the files that you want to remove. As you can see, it is just a simple three-step process. Nevertheless, this is just the tip of the ice-berg. 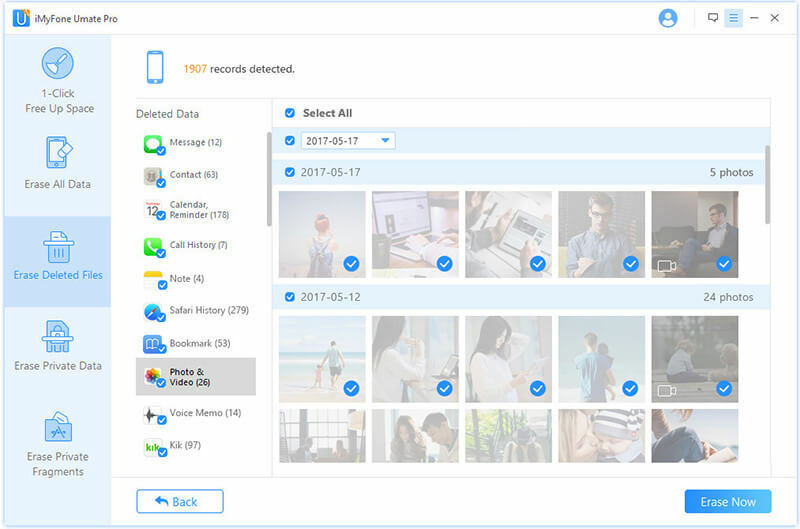 With iMyFone Umate Pro you can delete other iPhone items: you can mass delete videos, photos and other files including apps that you do not use. Photos can even also be compressed and exported to PC. The iPhone photo compression can reclaim 75% of photo space. Protecting your privacy is perhaps the most important and critical reason as to delete iPhone files permanently. Most commonly, it is due to the fact that many users sell their older version of iPhone. However, doing so exposes the seller to the risk of having his or her data being abused by the buyer. As such, it is vital for iPhone sellers to make sure they have deleted each and every file that may prove to be a security hazard in the future. The users should make sure that all the data that has been deleted is completely irrecoverable at the same time. However, simply deleting your files may not work, the files that are deleted in a simple manner can be easily recovered using various data recovery tools. The files need to be removed entirely from the system. iMyFone Umate Pro is therefore the ideal software to allow you to permanently delete iPhone data. Its “Erase Deleted Files” feature lets you remove deleted files completely and make them 100% unrecoverable. By using the “Erase Private Data” option, you can also erase all kinds of private data including your WhatsApp chat history, messages, call histories, contacts, notes and much more. Both of these options allow you to preview the files that have been deleted or those that are private. You can therefore individually select the files that you do not want. Having an iPhone is definitely not easy. Every time there is a new update and a number of unnecessary files accumulate as discussed above. All of these things surely cause your phone to perform poorly. As more and more files accumulate and the storage space gets filled up, the phone starts getting slower along with getting stuck most of the time. This is certainly annoying and can come in your way while you are doing something important. Although deleting iPhone files is an effective method of allowing your phone to work better, it nonetheless, takes a lot of time doing it manually. Deleting the file categories individually can be very frustrating not only because the process is slow, but also because the method is prone to errors. Here are some easy methods that you can use to optimize your iPhone performance. Using iMyFone Umate Pro to delete iPhone junk and temporary files can be a very easy task. As mentioned earlier, you can use the 1-Click clean-up feature to do so. You can also use the Erase iPhone Data feature to completely wipe your phone. Doing so will delete everything that you have on your phone and it will make your phone seem as if it were new. Just a couple of clicks can save you the trouble of deleting all the file categories one by one. Another method is to simply upgrade your phone so that it has more storage. You may get an SD card in which you can store most of your files instead of the Phone’s memory. This may be your last resort; however, using Factory Reset is the most commonly used method if nothing else works. You can do this by going to the settings menu and navigating to the Factory Reset option.